Tropical Depression 18W formed west of Guam and strengthened into a tropical storm. NASA-NOAA's Suomi NPP satellite saw the storm heading into the Philippine Sea early on Sept. 12. On Sept. 12 at 0346 UTC (Sept. 11 at 11:46 p.m. EDT) NASA-NOAA's Suomi NPP satellite passed over Tropical Depression 18W and measured cloud-top temperatures. The Visible Infrared Imaging Radiometer Suite (VIIRS) instrument aboard NASA-NOAA's Suomi NPP satellite captured an infrared image of the storm that revealed the location of coldest cloud top temperatures and strongest storms. VIIRS data showed cloud top temperatures of strong thunderstorms around the center of circulation as cold as minus 80 degrees Fahrenheit (minus 62.2 Celsius). Temperatures that cold indicate strong uplift in the storm and cloud tops high into the troposphere. NASA research has shown that storms with cloud tops that cold have the ability to generate heavy rain. 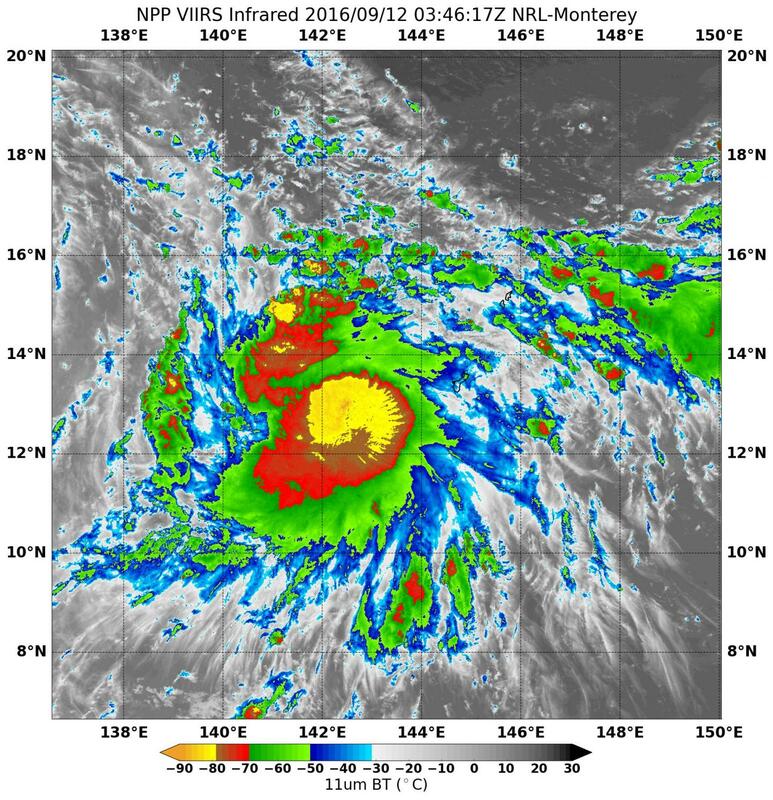 The National Weather Service (NWS) in Tiyan, Guam said at 5 a.m. EDT (0900 UTC) on Monday, Sept. 12, the center of Tropical Storm 18W was located near latitude 13.2 degrees North and longitude 141.1 degrees East. 18W was moving west at 17 mph. Tropical storm 18W is forecast to track toward the west-northwest over the next day before turning slowly northwest Tuesday night and Wednesday, Sept. 14. Maximum sustained winds have increased to 45 mph, making 18W a tropical storm. Intensification is expected to continue over the next few days...and tropical storm 18W could become a typhoon Tuesday afternoon or Tuesday night. There were no watches or warnings issued from the NWS, Guam.